This Wallachian coin is present on Romanian coins through the kind permission of Mr. Pavlos S. Pavlou. 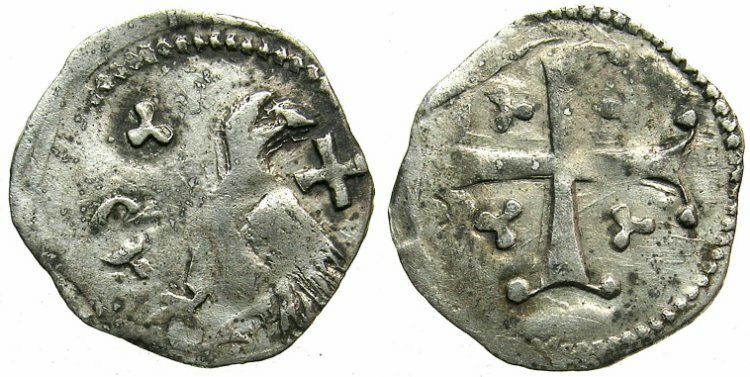 This coin was attributed to Dan I (1383-1386), son of Radu I (~1377 - 1383), brother of Mircea the Old (1386 - 1418). The coin seems to corrrespond to position 88 of the Monede şi bancnote româneşti by George Buzdugan, Octavian Luchian and Constantin Oprescu (1976). As a type this coin is known to Romanian numismatics as Walachian ban. The ban was equal to a half denarius or obol of the Hungarian kingdom.